Ashes Grammar, the sophomore release from Philadelphia’s A Sunny Day in Glasgow was a yearend highlight in 2009. A year later, the dream pop band followed that up with the excellent download album Autumn, again… then disappeared for a few years. With band members now spread throughout the world, Sea When Absent was a more collaborative effort built from emailing tracks back and forth with producer Jeff Ziegler helping put things together. One noticeable change is the intertwining of vocals Jen Goma and Anne Fredrickson that get pushed up in the mix. This helps give many tracks a more focused sound than previous efforts and can often sound like a more ethereal Sleigh Bells. But even though you can hear the vocals, the lyrics are often still a mystery, like the best Belinda Butcher moments for My Bloody Valentine. The laidback summertime lushness of “Crushin’” is as sweet as honeysuckle. “MTLOV (Minor Keys)” is pure pop with a sped up Ronette’s drumbeat that makes it dance floor ready… If the dance floor was your front porch at 2PM, drinking vodka lemonade, and watching cars go by. “The Body, It Bends” is an ocean of sound. An acoustic guitar powers the song before the synths washes everything over before horns suddenly appear 2/3rds of the way through. Some of the only discernible lyrics appear on single, “In Love With Useless…”. “Don’t Stop, sometimes I feel so happy, I’m love with useless”. It’s this joy runs through the entire album. 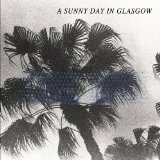 Making the complex sound simple and the hazy sound focused, Sea When Absent is A Sunny Day in Glasgow’s best work yet.